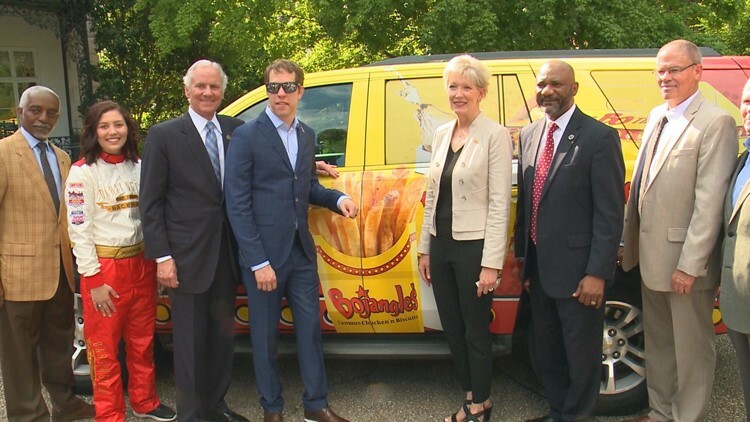 Defending Bojangles Southern 500 champion Brad Keselowski dropped by the Governor's Mansion to help promote the race which is set for Labor Day weekend. Labor Day weekend of 2018 was quite special for Brad Keselowski who won both races at Darlington. But his victory in the Bojangles Southern 500 was another milestone for the resume of a NASCAR superstar. On Thursday, Keselowski was at the Governor's Mansion for Darlington Day to help promote the upcoming race and the defending champion knows what winning there did for an already championship career. "The Southern 500 is considered a crown jewel for any NASCAR driver to win. It's just how tough this race track is," said Keselowski. "It's one of the toughest on the circuit. Not only is it really hot on Labor Day weekend for the race car drivers, but I would add to it. The track is really slick, really narrow, really tough to get a hold of and when you win Darlington, by God, you've earned it. It's not a race track where you just fall into having success. So, it means a lot to us as drivers to have that success there. Last year, being my first (Cup) win at Darlington and to sweep the weekend, that one's going to stay with me for some time and I'm very proud of it." Keselowski added that to have his name amongst the legend who have won at Darlington is further evidence just how this trace is revered. "You know, I think of guys like David Pearson, Richard Petty, Dale Earnhardt," he said. "Those are guys that have left their mark, their legacy at Darlington. They're superstars in the sport and will be a part of its history forever. To join that list is a big deal." Keselowski didn't get an appearance fee for coming to Columbia but his Checkered Flag Foundation did get a check for $2,000 from the Darlington Raceway. Brad's foundation helps the men and women in the military and those first responders who serve the country.